New KTM 390 Duke is a real evolution story that all manufacturers should follow in the upcoming updates. The motorcycle looks totally refreshed while shares just the most required components with the older model. The tyres and first half of the frame remains the same while the engine has undergone certain measures to comply with the strict Euro4 norms. This adds an exhaust can to the motorcycle while all other changes were fully voluntary. The fuel tank is even more sharper than ever, carrying 13.5 liters of fuel over the 11 liter tank used on the earlier model. The front brake has grown to 320 mm while the dual channel ABS has been retained for enhanced safety of the riders. The second half of the frame has been altered and finished in White on the new model. It now uses a colored TFT display with optional connectivity to your smartphone, ride by wire throttle and a raised seat height from 800 to 830 mm. The ground clearance has even improved from 170 to 185 mm on the 2018 KTM 390 Duke. The 2018 Duke 390 generates same 43.5 PS of maximum power but now @ 9000 rpm and the new model develops 37 NM torque @ 7000 rpm. The outgoing model develops 43.5 PS @ 9500 rpm and 35 NM @ 7250 rpm. 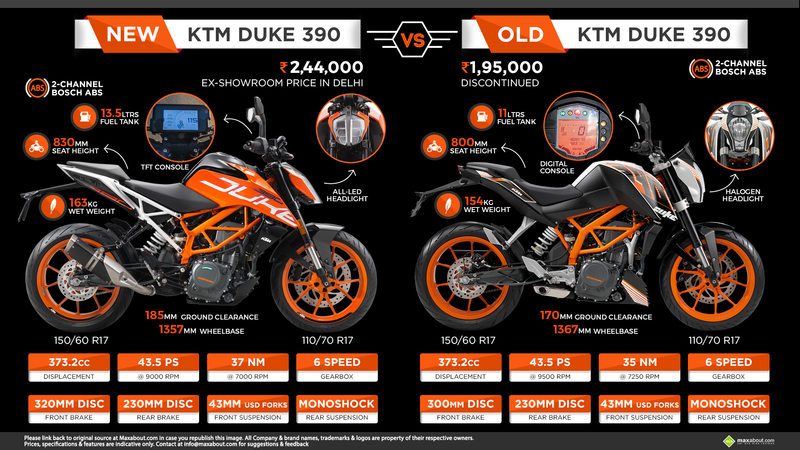 Read More about the all-new model of 390 Duke. Downloaded 207 times this week.